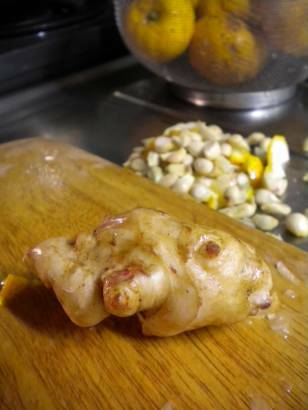 Japan Farmers Markets: Yacon or Jerusalem Artichoke? One of the great thrills of a recent hike (other than great views of Mount Fuji and the fun of my companions) was finding a number of vegetable stalls at the end of the trail. (Ok, the monkey's were a highlight, too.) We all came home with yuzu, green tea, umeboshi, a handful of winter greens, and ginger. Well, so we thought. It turns out that what I thought was ginger for the yuzu-ginger marmalade I was dreaming up was something more potato-like. The distinctive ginger smell was lacking, and when I nibbled on them they were firm and sweetly bland. (Luckily for the marmalade I still had some ginger from a local vegetable stand.) These went back in the drawer for further investigation. Late last week a friend we'd visited on our first trip to Hokkaido came over for dinner. We shared a typical house meal - salad, miso, and rice - with an assortment of pickled things scattered about the table for variety. The miso contained shitake mushrooms, potatoes, carrots, lots of ginger, komatsuna, and these little potato-like things. They turned rather soft in the miso and had no particular flavor. Our friend's mother happened to call while he was still here, and so we quickly sent her a photo of the mystery vegetable hoping for identification. Her immediate response was yacon. Even though I'm only a recent grower I was a bit skeptical. The yacon I know are big fatties sweetly flavored with an apple-like texture. These met neither of these criteria. A quick Facebook chat with Rhizowen Radix suggested they might be the yacon stem tubers used for propagation, but further discussion brought up the idea that they might be Jerusalem Artichokes. That looks very like a Jerusalem. Plant some and see! I think you are both quite right, Emma and Robert. I'm still planning to save some for future planting, and then eating the rest! Just a reminder that once panted, these spread, and can never be totally removed from the garden. Plant in an out of the way place, or in some sort of contained area. I harvest about 30 pounds a year, and they are trying to move into all of my gardening area. I love them raw and cooked, high in iron and inulin and they bring down glycemic levels. So great to combine with potatoes. Quite right, Linda Diane! Since my garden is at the farm, I'm doubly concerned about bringing in something that could take over. Most likely I'll try them in containers and see what happens. They are tasty, but the aftermath in my tummy always makes me hesitate. I very rarely feel this way about any food, but it's enough for me to really think twice. Perhaps they'd make a good gift?